Swimming with babies and toddler can be a bit tricky. That’s why having the right swim diaper is so important. It’s one less thing you need to worry about while you have your little one in the water. That’s why we researched some of the top-rated, best-selling brands. 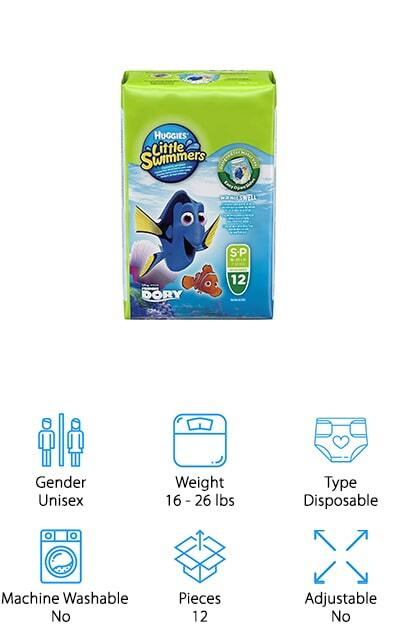 If you want a handy disposable or an adjustable swim diaper, we’ll help you find the right one for you. First, let’s look at some of the main things to consider. Gender: Swim diapers aren’t designed to absorb liquids so there are not absorption zones that work better for boys or girls. Most of these diapers are unisex and come in a range of beautiful patterns your kids will love. Weight: Some of these diapers are completely adjustable and one can fit the entire range given. Others come in various sizes that fit the weight range. Make sure you get the right size for your little one! Type: There are 2 types, disposable and reusable. While reusable diapers are better for you budget and the environment, we know that sometimes, you just don’t want to deal with the mess and disposable diapers are the way to go. Machine Washable: All of the reusable diapers on our list are also machine washable, which is good because they can get pretty gross. Make sure you check the washing instructions on the diaper you choose just to be on the safe side. Pieces: Reusable diapers typically come as only one item, though we did find an awesome set that includes 3. Obviously, the disposable options on our list come with much more. Specifically, 17 to 20 depending on the size. 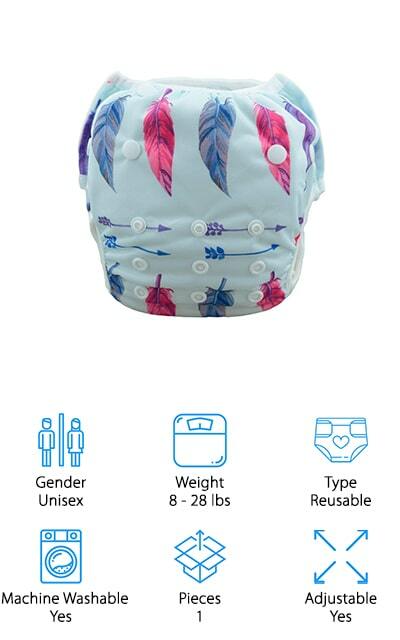 Adjustable: Some of the reusable swim diapers are adjustable. They have a snapping system so they can grow with your baby. With proper care, you can actually end up using them for years as your infant becomes a toddler. Now that you know a little more about what to look for, let’s look at our top picks. We put our top and budget picks right at the top of the list. If you’re in a hurry, this is the best place to start. Stick around until the end if you can, though. Whether you’re looking for pink strawberries or a solid red swim diaper, we have some great options for you. Okay, let’s dive right in. The top pick also happens to be the best reusable swim diapers overall, in part because they’re just so adorable. 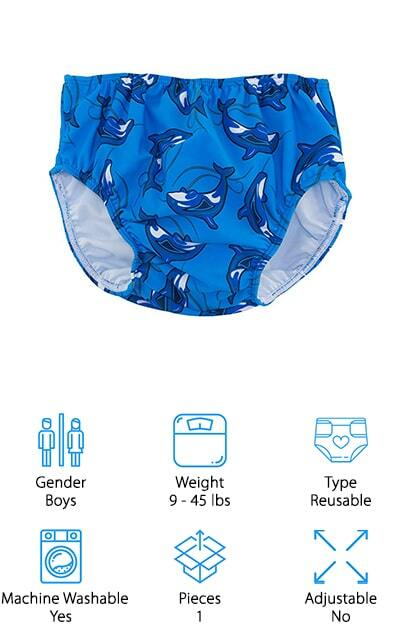 This reusable swim diaper from Nageuret is great because it adjusts from between diaper sizes N and 5, or 8 to 36 pounds, which means you can literally use this product for years. There are snaps around the waist and legs and size adjustments for the height of the diaper, too. The outer shell is made of waterproof polyester and the patterns are super cute. Plus, they’re also machine washable. That’s not all, this diaper even includes a 1-year money-back guarantee. If something breaks, they’ll not only refund your money, they’ll also give you a new swim diaper, free of charge. And get this: 5% of sales are donated to Compassion International. Our budget pick for best swim diapers for infants is Huggies Little Swimmers. Reusable diapers are great for a lot of reasons but sometimes, you just want a quick and painless cleanup. Something you can just toss in the trash and not have to clean. Let’s face it, babies can be gross. If you’d rather not deal with cleaning potentially icky messes, Huggies Little Swimmers are for you. They’re unisex and feature various characters from Disney Pixar that your little one will love. The sides are stretchy and tear away easily so you can get them off quickly when you need to. They’re made of a unique absorbent material that doesn’t swell like diapers do but still keeps the pool water clean. That’s not all, they even have special leak-guards to prevent even big messes from escaping. FINIS Swim Diaper is next and we think it’s the best swim diaper for toddlers. Sizes range from small to 4T, which includes babies and toddlers weighing 9 to 45 pounds. These reusable diapers are made from waterproof polyester. The inner lining is soft against baby’s skin to prevent any irritation or discomfort. The legs and waist are cinched with secure elastic to make sure any solid waste stays contained in the diaper. They also provide protection from the sun, specifically UPF 50. These diapers are not one-size-fits-all. They’re actually designed in specific sizes according to weight to make sure that they fit your baby perfectly at every size. One more thing, there are 9 different bright, fun prints to choose from so you’re sure to find one that your little one will love. 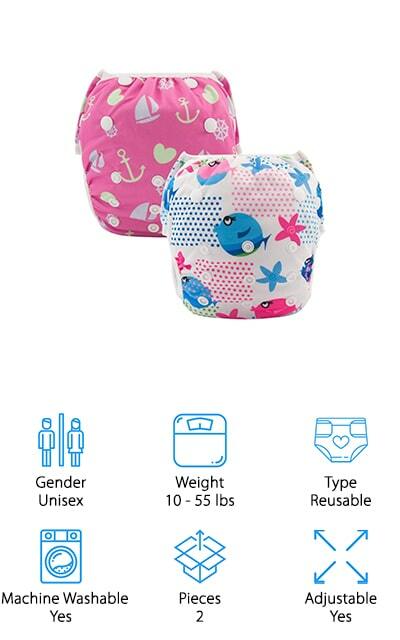 If you’re looking for the best baby swim diaper for your little girl, take a look at these reusable ones from Alvababy. These diapers are adjustable at the thigh and waist and will fit your little one from birth up to 2 years. There are 3 different adjusting snaps altogether and you can tailor it to your own baby as she grows. 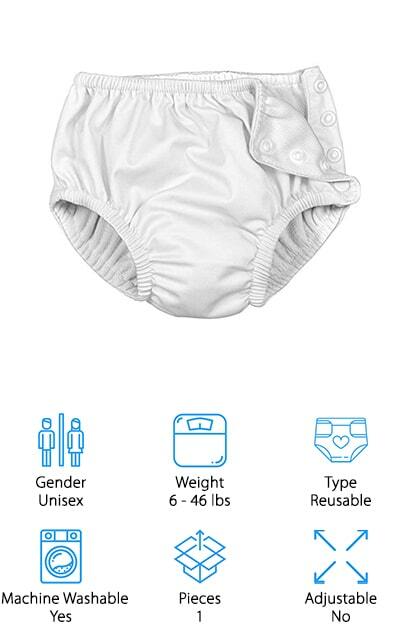 The outer layer of these diapers is made of waterproof polyester while leg and waist openings use soft, stretchy lycra to make sure nothing escapes from the diaper into the pool. There are 9 different colors available, some that your little boy would love, too. That’s not all, Alvababy even offers a 1-year warranty. If you have any issues at this time you can either get a refund or a new diaper, your choice. Another great choice for the best cloth swim diaper is this one from i play. They’re reusable, machine washable, and made of 100% polyester. One thing that we really like about this design is that they are made to pull on easily but they also have a button snap up the left side so they’re easy to take off. 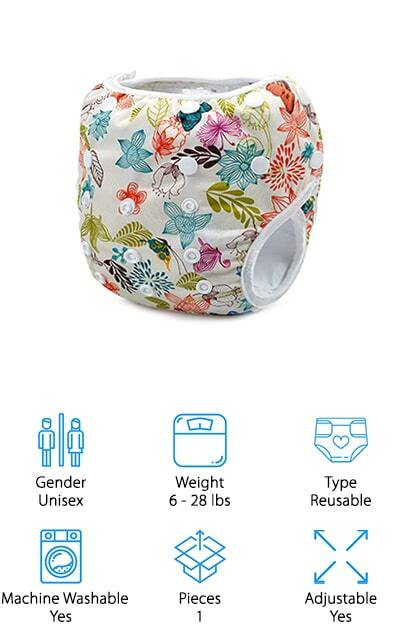 These diapers provide unique triple layer protection. There’s a wicking layer next to baby’s skin to pull away excess liquid and prevent skin irritation. Next is a thin absorbent layer that gives light protection for outside of the pool. Lastly, the out layer is completely waterproof and helps keep any embarrassing messes contained while you’re in the pool. That’s not all, they’re available in 4 different colors, too: aqua, hot pink, white, and royal blue. Next up in our list is this permanent swim diaper from Storeofbaby. 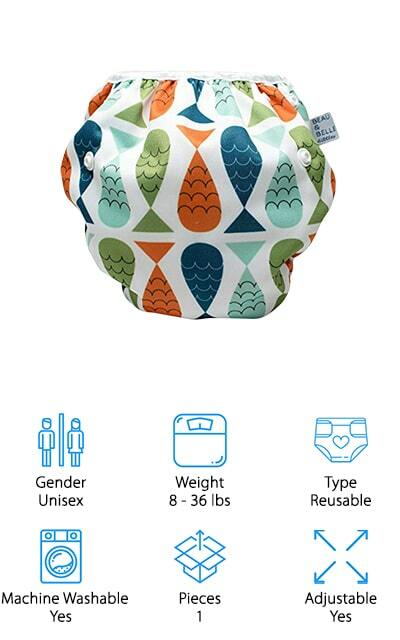 Not only is this diaper reusable, but it’s also made to fit babies up to 28 pounds. That’s roughly until your baby is about 3 years old which means you’ll get a lot of use out of this diaper. The waterproof outer layer is made of polyester and designed to make sure no solid waste makes its way out of the diaper and into the pool. There are elastics at the waist and leg with soft bindings to keep the diaper taut while still being easy to get on and off. And here’s the kicker, there are actually 33 different patterns to choose from, including water themed designs like sea turtles and whales as well as florals, fruits, and abstract designs. Wegreeco Swim Diapers are a good choice if you want a washable swim diaper that’s completely adjustable and comes in kid-friendly, cute prints. The polyester outer layer was specifically designed to contain solid waste so there are no embarrassing moments at the pool. 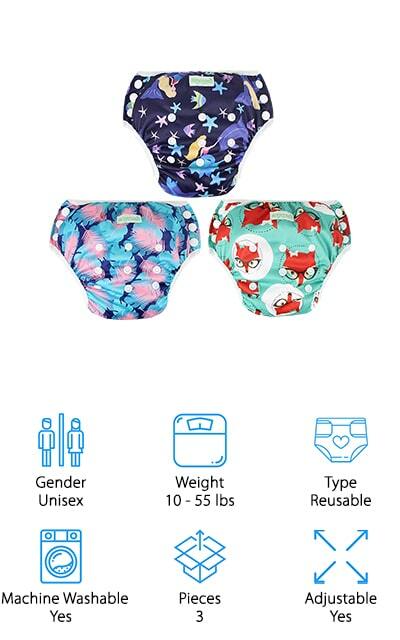 These swim diapers come in sets of 3, each with a different pattern. They’re machine washable and the material won’t fade so they’ll stay just as adorable for a long time. We love that this is a set of 3 because it means you’ll have a new diaper available when the old one is in the wash. Though these are adjustable, they do come in 2 different sizes. Small is suitable for babies and toddlers between 10 and 30 pounds or while large is for larger kids weighing 18 to 55 pounds. Another great reusable baby swim diaper cover is from Babygoal. They have some really adorable patterns for baby boys and girls, including some really awesome gender neutral options. These diapers feature adjustable straps and are a good fit for babies up to 2 years old or from 8 to 28 pounds. The outer layer is made of waterproof, breathable polyester that prevents any solid waste from leaking out of the diaper. Elastic at the legs and waist help get in on and off really easily. Inside, there’s polyester mesh that’s easy to clean and soft and gentle against your little one’s skin. They also don’t contain any harsh chemicals, BPA, or latex, as well. Babygoal even offers a satisfaction guarantee and will either give you your money back or a new diaper if you're not satisfied with the product. Up next are Sunbusters Swim Diapers with adorable designs that any little boy will love. The outer layer is made of nylon and spandex so it’s stretchy and holds everything in place. Inside, there’s a comfortable polyester lining that’s easy to clean and keeps solid waste contained. There’s more, the fabrics are also rated UPF 50+ so sensitive areas will be protected from the sun’s harmful rays. In fact, these diapers block 98% of UVA and UVB rays, wet or dry. There’s more, elastic around the legs and waist makes it easy to get your little one into and out of these diapers. Plus, they fit snugly enough to make sure that nothing escapes and contaminates the pool. They’re available in sizes small to 4T, which covers weights of 9 to 45 pounds. 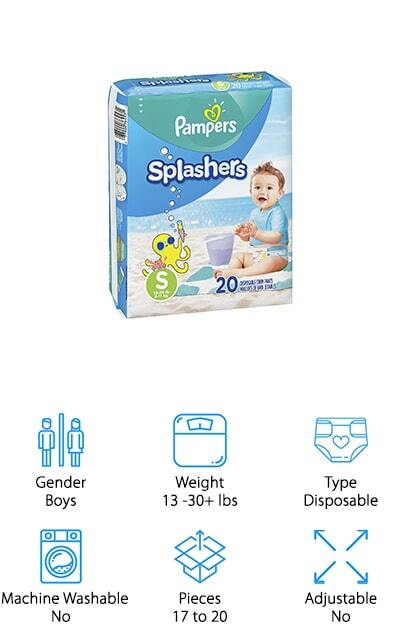 Last up is another great option for anyone looking for something disposable, Pampers Splashers Swim Diapers. Splashers are available in small, medium, and large which covers babies and toddlers who weigh 13 to greater than 30 pounds. These diapers don’t swell in water like regular diapers. They feature dual-guard leak barriers that fit snugly around the legs and waist to help prevent anything from escaping while in the pool. 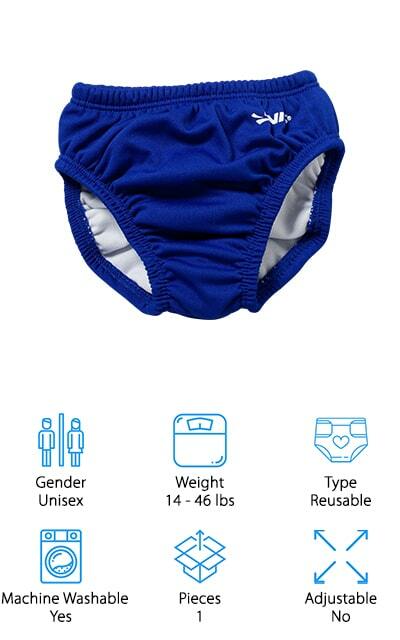 Plus, the 360-degree stretchy waistband keeps your little one comfortable while they play in the water. The easy-tear sides make it really easy to get these diapers off after the pool or if they’re soiled. They feature cute, unisex designs with swim and water-inspired graphics like an octopus, sunshine, and crabs. If you don’t want to deal with the mess of a soiled, reusable diaper, disposable Pampers Splashers are a great choice.